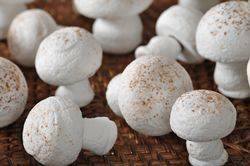 I love to decorate my Christmas Yule Log with these Meringue Mushrooms. They are crispy and nice and sweet which makes them the perfect accompaniment to the rich and chocolately Yule Log. But they are also very nice on their own. For a gift, package them in a party bag tied with a festive ribbon or place them in a basket. While there is a recipe for Meringue Mushrooms in Fannie Farmer's Original 1896 Boston Cooking School Cookbook, I think Maida Heatter is responsible for their current popularity. She has a recipe for Meringue Mushrooms in her lovely 1978 book "Book of Great Chocolate Desserts" which is the same recipe she used to win first prize for originality at the International Cooking Olympics. Meringue Mushrooms are really not difficult to make. But there are a few things to keep in mind when making any meringue. First, make sure the egg whites are at room temperature and free of any specks of egg yolk. Superfine sugar makes for a smoother meringue as it is easier for the sugar to dissolve. Make sure your bowl and whisk are clean and free of grease to obtain maximum volume. Adding the sugar gradually to the egg whites ensures that the sugar completely dissolves and does not produce a gritty meringue. Cream of tartar is used in the whipping of egg whites to stabilize them and allows them to reach maximum volume (although you can use an equal amount of lemon juice). Also, it is a good idea to use parchment paper to line your baking sheets. Distribute the caps and stems evenly on the baking sheet to ensure even baking. You can put the 'caps' on one sheet and 'stems' on another, as I have done, or you can bake them all on one baking sheet. To prevent cracking of the meringues, do not open the oven door during the first hour of the baking time. Baking the meringues in a slow oven allows for gradual evaporation of the moisture from the meringues. Meringue Mushrooms: Preheat your oven to 200 degrees F (100 degrees C) and place two oven racks in the upper and lower thirds of your oven. You will need two baking sheets lined with parchment paper. To make all the mushrooms the same size, I like to make a template. Take a piece of parchment paper and draw 24 - 2 inch (5 cm) circles, spacing the circles about 1 inch (2.5 cm) apart. Flip the parchment paper over, and place it on your baking sheet. Have ready a large piping bag fitted with a round plain 1/3 inch tip (8 mm) (I used Ateco #804). In the bowl of your electric mixer, fitted with the whisk attachment, (or with a hand mixer) beat the egg whites and cream of tartar, on medium low speed until soft peaks form. Continue beating, on high speed, gradually adding the superfine sugar, until the whites are shiny and hold stiff peaks. (To make sure that the sugar has fully dissolved, rub a little of the meringue between your fingers. It should feel smooth, not gritty. If it feels gritty then beat the meringue a little more.) Transfer the meringue to your piping bag. To Pipe Caps: Holding the pastry bag upright and close to the parchment paper, and with even pressure, pipe the meringue into 2 inch (5 cm) rounds that are about 1 inch (2.5 cm) high. Smooth out any tips on the tops of the meringues using a wet fingertip. To Pipe Stems: Holding the pastry bag upright and close to the parchment paper, and with even pressure, pipe the meringue into a cone-shape that is about 1 inch (2.5 cm) high. Try to keep the stems as straight as possible. Some of the stems may fall over during baking, so it is best to make a few extra stems. Bake the meringues for about 1 1/4 to 1 1/2 hours, or until the meringues are firm enough that they easily release from the parchment paper without sticking. Once baked, turn off the oven, have the oven door slightly ajar, and allow the meringues to completely cool and dry out. I like to leave them in the turned off oven at least a couple of hours (or preferably overnight). To attach the mushroom stems to the caps, spread the bottom of each mushroom cap with a little melted chocolate (acts like a glue). Then gently press the top of a stem into the center of the mushroom cap. Let the chocolate dry by placing the meringue mushrooms upside down on a baking sheet. Once the chocolate hardens, lightly dust the tops of the mushrooms with cocoa powder. Store in an airtight container for several weeks. If you live in a humid climate I find it best to store the meringue mushrooms in the refrigerator. Makes about 24 - 2 inch (5 cm) Meringue Mushrooms.